You’d think that, even without signs or cones or big yellow flashing warning lights, you’d be able to tell if you were parking in wet concrete because, well, it’s wet. That wetness didn’t seem to stop a DeKalb County, Georgia, woman from doing so with her BMW, and she’s claiming there was no signage warning her the cement was wet. The county disagrees. 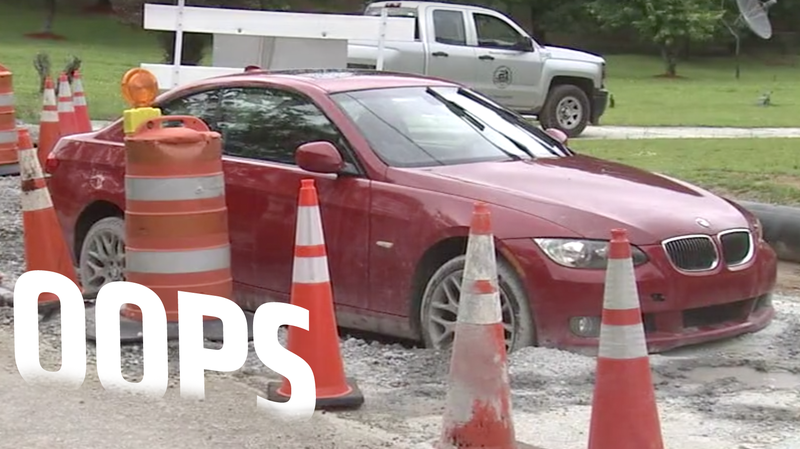 According to Fox 5, Eleysia Morris says there were no signs or cones or anything when she parked her new-to-her graduation-gift BMW 3-series (E92) coupé in front of her father’s house. There was, however, a bunch of wet concrete. As we’ve seen, driving into wet concrete is a very expensive mistake; I’d try to get out of it, too. In a video on Fox5's Facebook page, Morris says a pickup truck was driving towards her, honking “aggressively,” which she attempted to avoid, ending up in the wet concrete. Was that pickup part of the construction crew, trying to warn her, unsuccessfully? While it would be a fun bit of schadenfreude to point and laugh at the BMW driver, the truth is we’re not sure exactly what happened. If the Country proves to be correct, with flaggers and barricades and all that, then I guess point and laugh away, right?